Your future closet looks mighty inspiring. By Yiqing Shao·	 3/7/2016, 7:55 a.m.
More than 60 one-of-a-kind pieces appear in the MFA’s new exhibit, #techstyle, which looks at how artists and designers are using new technologies to present innovative ideas for the future of fashion. The exhibit has high impact and overloads the senses in the best way possible. Everywhere you turn, there’s fire, water, snakes, and spikes. Some fashions respond to their environment, and many are environmentally friendly. With works commissioned and collected from around the world (and our backyard), #techstyle gives visitors a glimpse of what our closets might one day look like. The future, apparently, is literally bright. Check out some highlights below, and see the exhibit for yourself now through July 10. Commissioned by the MFA, this dress designed by London’s CuteCircuit really is gosh darn cute. Make selections on the adjacent tablet, and the dress is flooded with the pattern of your choice: hearts, stars, and so on. How? LEDs, my friends, 10,000 semiconducting microLEDs. Van Herpen partnered with Oxman of MIT Media Lab to create this provocative piece, which was made with a Stratasys Connex 3-D printer. 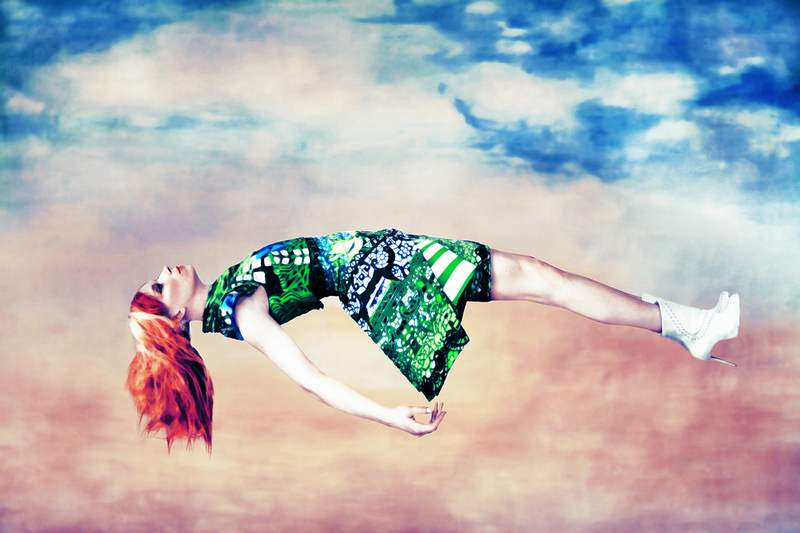 The nature-inspired design was shown on the Paris runway in January 2013. 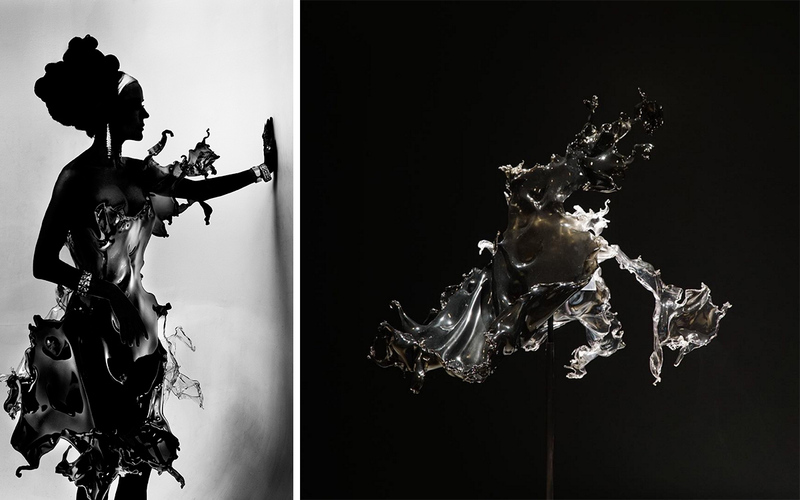 From a burning Phoenix to a cool splash of water—filmmaker Nick Knight and SHOWstudio staff used high-speed cameras to capture model Daphne Guinness being splashed with water. Then Van Herpen used the footage to make a solid dress out of plastic and acrylic spray that looks like a floating splash of water. If McQueen’s iconic animalistic heels above make your feet hurt just looking at them, let designer Issey Miyake calm your nerves. His origami-like pieces are a joy to see fold, unfold, and fold again. In #techstyle, check out his 3-D Steam Stretch at work and other flat-to-fab fashions. 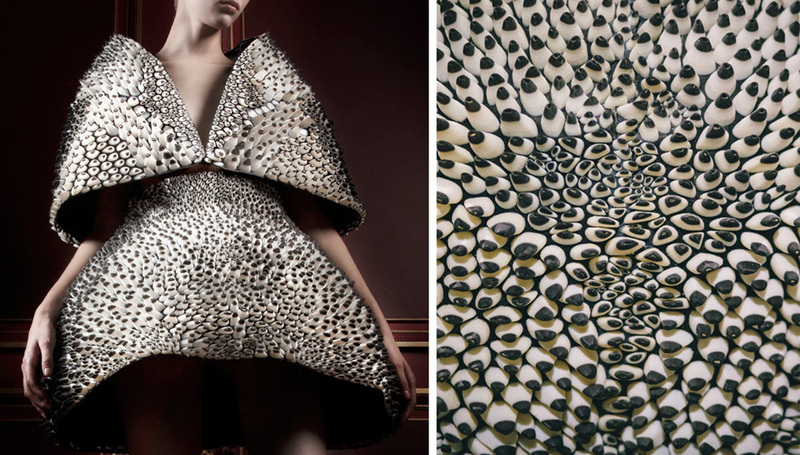 Somerville-based Nervous System has a 3-D-printed dress inspired by petals on view at the MFA. 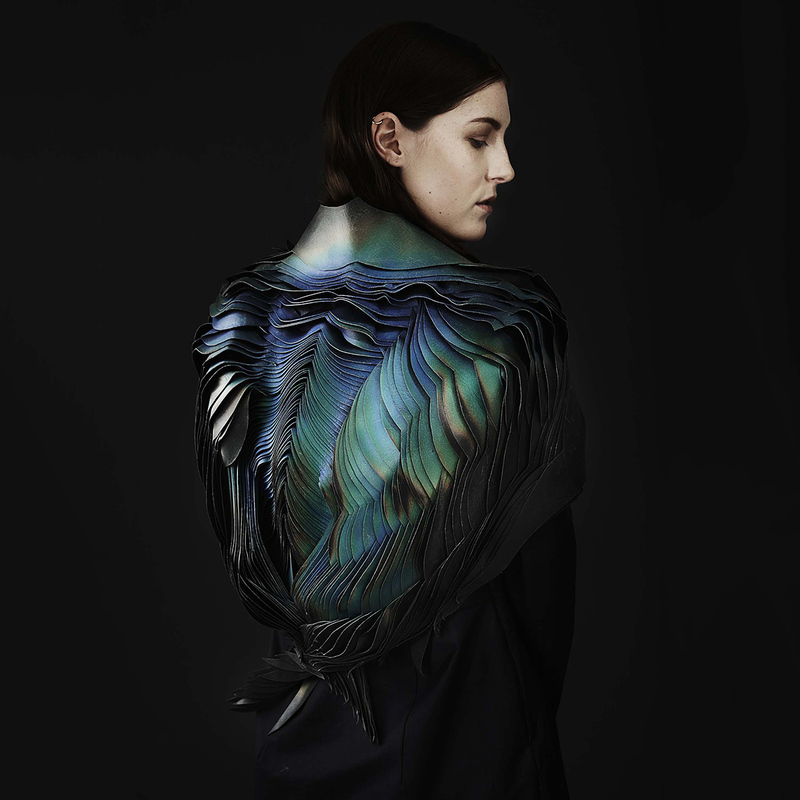 The design is created from a body scan and can be customized using an online app. The “Kinematics” dress is not the only notable fashion endeavor for Nervous System. The team has also been working with New Balance on 3-D-printed shoes. Raviv came up with the idea for this design while still a student at Shenkar College of Engineering and Design in Tel Aviv, entering commands the computer could not compute. She then re-created those patterns for “Bodysuit” using traditional techniques, laser cutting, and 3D printing. Feeling prickly? There’s much more to this ensemble than what meets the eye. The pins on the outfit move when triggered by nearby sounds. The piece will be “turned on” every Wednesday 1-2 p.m. and 6-7 p.m.
#Techstyle, March 6-July 10, Museum of Fine Arts Boston, 465 Huntington Ave., Boston, 617-267-9300, mfa.org.